Like the Marvel Zombies 4 limited series (which I have just reviewed), Dark Reign: Hawkeye started strongly. 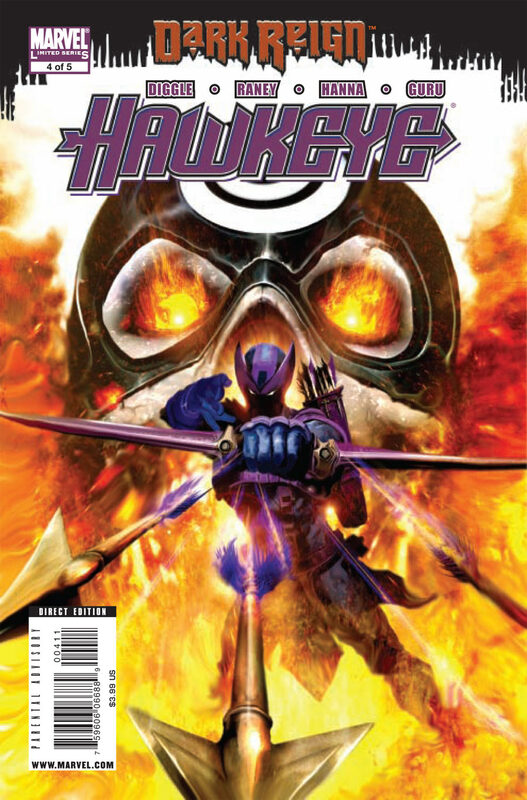 Now, at issue 4, I feel it is starting to sag a little, with the reveal of who / what is behind the multiple Bullseye sightings and the whole Bullseye army that faced Hawkeye (aka the real Bullseye) at the end of last issue. Well, it didn’t shake me to the core, to be honest. In fact, it felt a bit limp, but it picked up toward the end. The problem is that, like so many other titles, you never get the feeling in this that Bullseye is in any real danger – and if he was, so what? Are you supposed to care that a cold-blooded Killer, a psychopath, could die at the hands of another? Overall, I don’t really see the point. What do we learn about Bullseye? Not a lot. About the ‘Dark Reign’ – well maybe there is a little more colour and shade added to that storyline with these issues. I don’t know a lot about the other Dark Reign titles, but I know there are a lot of them, but on this evidence, I am probably not the target market. I look forward to Diggles upcoming work on Daredevil, more so than the final issue of this series.